Leading today, transforming tomorrow's standards of care. An estimated 5.7 million Americans are living with Alzheimer’s disease – 390,000 are residents of New York. By 2050, that number is expected to surpass 16 million. The number of known individuals with Alzheimer's disease is underrepresented due to the lack of early detection/diagnosis and underreporting dementia as a cause of death on death certificates. In 2016, as a proactive response to the “impending tsunami of dementia,” the New York State Department of Health announced the unprecedented Alzheimer’s Caregiver Support Initiative, which supported, in part, the establishment of 10 Centers of Excellence for Alzheimer’s Disease (CEAD) across New York state. Currently, in New York state alone, there are approximately 1 million caregivers for people with Alzheimer’s disease or a related dementias, providing over 1 billion hours of unpaid caregiving, valuing over $14 billion. New York is first in the nation to address this public health crisis by committing financial resources that support persons with Alzheimer’s disease and their caregivers. The aims of the Alzheimer’s Disease Caregiver Initiative include providing early diagnosis and care management; supporting patients at home and in the community; preventing emergency room visits and hospitalizations; and improving health, quality of life and well-being for persons with dementia and their caregivers. Under the leadership of Bruce Troen, professor and chief of the division of geriatrics and palliative medicine at the University at Buffalo, and Kinga Szigeti, neurologist and founding director of the Alzheimer’s Disease and Memory Disorders Center at UB, the Center of Excellence for Alzheimer’s Disease in Western New York (CEAD-WNY) provides diagnostic and care support services to enhance population health for persons with dementia and their caregivers and enhances the capacity for primary care providers to diagnose and treat cognitive impairment in their own practices. Marsha Lewis, professor and dean of the School of Nursing, and Linda Steeg, clinical associate professor at the School of Nursing, are co-investigators. Leilani Pelletier serves as the program director. CEAD is charged with improving the rates of screening and early diagnosis of diseases causing dementia and improving care management. A timely and accurate diagnosis is critical to increasing enrollment in clinical trials in the pursuit of effective therapies to change the trajectory of this disease. Through a partnership with the University at Albany's School of Public Health, the NYS Department of Health is able to evaluate the effectiveness of the programs, including the impact on Medicaid spending. Evaluation of the outcomes and findings will be disseminated to the field. Primary care clinicians or anyone interested in more information regarding dementia screening, diagnosis, dementia care management or clinical trials are encouraged to contact CEAD-WNY at 716-829-5432. Every breath. Every beat. Every second. We are there. 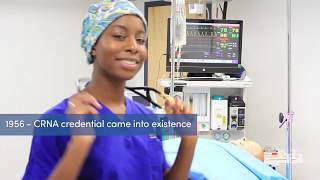 In honor of CRNA Week 2019, UB SRNA student Charnelle Lewis shares some interesting facts about nurse anesthesia and the history of the profession. Check back soon for more exciting events! Tell us about your latest grants, publications and projects.